As technology advances, more modern models of garage door systems tend to offer homeowners more than simply a new look and reliability. Many name brand manufacturers have started offering different features and options that can make your garage feel like it arrived here from the future. Back in its day, the remote control was considered the peak of technological advancement. Nowadays, though, it's practically a relic of old times. While a wireless keypad is a great alternative, many modern opener models are also capable of offering you WiFi compatibility, which means you'll be able to access, monitor and even operate them using your smartphone or a tablet. A great way to enhance the security of your home is to get a garage door opener that uses rolling code technology. This type of technology changes the communication codes your opener and its method of operation, be it a remote or a keypad of any kind, use to communicate. That means that not even the most tech-savvy burglar could "hijack" these codes in the hopes of using them to open your garage door and gain access to your home. The Genie Intellicode is a famous application of this technology. Many opener models can also offer you the option of using their operating system to check on the status of your door. You can look at a record of its recent opening and closing, see how long it's been since you've had it maintained, check the temperature inside your garage and a whole lot more. This can be a great method of making sure your garage door is cared for in due time and that none of its parts become too worse for wear. There's no need for you to start doing all the necessary research by yourself. Our experts can help you find the perfect opener for your garage door. We work with name brands such as Liftmaster and Craftsman, and any installation we perform can always be relied upon for a very long time. 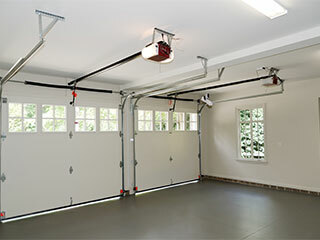 Call Garage Door Repair Huntington Station today for any related need.